Motivational speaker John Wood has just launched his new keynote: Purpose: The New Competitive Advantage. John Wood didn’t set out to change the world. He set out to take a vacation. But a trip to Nepal turned into a book drive, which turned into Room to Read, one of the fastest growing and most acclaimed charities of the past decade. To date, this remarkable non-profit has sponsored long-term scholarships for over 30,000 girls, distributed more than 14 million books, built 1,825 schools, established over 17,600 libraries, and trained over 50,000 teachers. A former senior Microsoft executive, John has always said that the key to his charity’s success is that he treated it like a business, and has spoken frequently about what the non-profit world can learn from the corporate world. But now, on the eve of Room to Read reaching its 10 millionth young student, John has written a new presentation, this time illuminating what businesses can learn from the social sector. In a word: purpose. John argues that corporate social responsibility is more than just a buzzword or a publicity stunt, but instead represents the new competitive advantage; a way to re-engage both customers and employees, and improve the bottom line. • “For-Profit” companies that have repositioned themselves as “For-Good” to appeal to a new generation of world-conscious consumers. Case studies include carmakers such as Toyota and Nissan assuming the mantle of “eco-friendly mobility”; and technology firms like Intel and Verizon making “improving education” a central mission. • The complete transformation of industries like makeup and fashion, allowing businesses often considered frivolous to become social actors on a global scale. (See MAC’s Viva Glam campaign, the fashion brand FEED, and the ‘buy one, give one’ business models of Warby Parker and TOMS). In this fast-paced, hyper-competitive world, companies and business leaders are always looking for an “edge”. From social media, to data mining, to employee perks, today’s businesses are under constant pressure to stay ahead of the pack. John uses colorful anecdotes, survey data, and the example of what he has built, to demonstrate that ‘purpose’ is the answer to many of today’s most pressing corporate challenges. This powerful new presentation shows business audiences big and small, new and experienced, that “cause” is no longer the enemy of commercialism, but the key to it. Audiences will be inspired to re-think old assumptions, to dream big, and to take immediate and concrete steps to be aligned with the business world’s newest — but often-overlooked —competitive advantage: purpose. 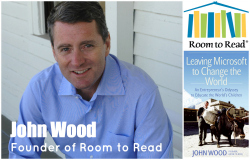 John Wood is the Founder of Room to Read, a global non-profit organization focused on literacy and gender equality in education. He is also the author of “Leaving Microsoft to Change the World: An Entrepreneur’s Odyssey to Educate the World’s Children,” which was chosen by Amazon as one of the Top Ten Business Narratives of 2006. John is a three-term member of the Clinton Global Initiative’s Advisory Board, and a frequent lecturer at Harvard’s Graduate School of Education, Harvard Business School, and NYU’s Stem School of Business. He was named one of Goldman Sachs’ “100 Most Intriguing Entrepreneurs,” as well as one of Time Magazine’s “Asian Heroes”, and was recently awarded – along with Malala Yousafzai – the World Children’s Prize by Queen Silvia of Sweden. John has appeared widely in major television and print news sources such as CNN, Charlie Rose, Oprah Winfrey Show, Fox News, MSNBC, Newsweek, The New York Times, Forbes, Fast Company, Financial Times, Wall Street Journal and many others. John’s past corporate speaking engagements include: Aon, Atlassian, Barclays, BHP, Bloomberg, Boeing, Citibank, Clinton Global Initiative, Credit Suisse, Cushman Wakefield, Deutsche Bank, Fidelity, Fossil, Goldman Sachs, Google, Hilton, IBM, JP Morgan, Merrill Lynch, Microsoft, National Australia Bank, Nike, Oracle, PepsiCo, Royal Bank of Scotland, Starbucks, Twitter, UBS, Wal – Mart and Wells Fargo. To book John for a speaking engagement, contact us at [email protected].